How Do Hydronic Heating Systems Work? 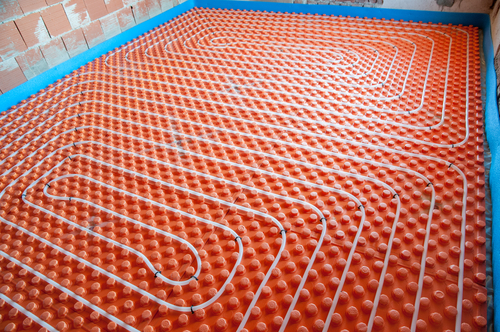 Hydronic heating is the most efficient and effective way to heat your home. Unlike conventional forced air systems, hydronic heating simply uses heated water to keep your home warm even on the coldest days. Hydronic systems provide a consistent and comfortable temperature that cannot be achieved with any other heating system. Installing hydronic heating in Glenwood Springs, CO is a more cost-effective, healthier and, quite honestly, better heating option for your family in every way. By now you’re probably thinking, “Okay, enough with the hype. How exactly does this miracle system work?” Well, we’d be glad to explain! Hydronic heating systems make use of one of the simplest forms of heat transfer: conduction. Conduction is the transfer of heat between objects that physically touch. Heat transfers from the warmer object to the cooler. Hydronic systems, in the simplest terms, transfer heat from the surface of pipes filled with hot water to the surfaces in your home. Cuts down on allergens: Because hydronic heating systems use conduction rather than blowing hot air into your home, it significantly reduces the amount of allergens and dust particles in the air. No dirty filter and vents means no dirty air! Saves energy and reduces heating costs: A hydronic system reduces your energy bill in more ways than one. Because a hydronic heating system radiates heat evenly throughout your home, you and your family can actually feel more comfortable at cooler temperatures, which means you won’t have to turn your heat up so high. In addition, the hydronic system simply has a much more efficient heating system that uses less energy and, therefore, reduces your energy bill. Provides a variety of customizable comfort options: One of the great things about using a conductive heat source is that you have the option to install it into a variety of surfaces, such as your bathroom floor. A hydronic heating system also allows you to customize the temperature from room to room. If you want your bedrooms warmer and the kitchen cooler, you can do that. Want to know more? Our knowledgeable team at Garrett Hansen Plumbing Inc. is always available to answer any questions you may have about installation options for hydronic heating in Glenwood Springs, CO. But you’d better hurry! Winter will be here sooner than you think and our schedule is filling up fast.Get in touch today to learn more!